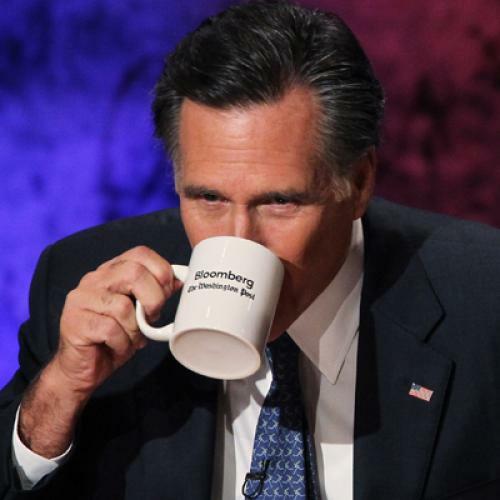 Daily Deadline: How Can a Poor Man Stand Mitt Romney? I suppose the most memorable line from last night’s Republican debate was Michele Bachmann’s reminder that Herman Cain’s 9-9-9 plan was actually an inversion of 6-6-6, the sign of the devil. I am almost mostly sure she was kidding. And even if not, well, she's not a serious candidate for the presidency anymore. I'm not worried about rich people; they're doing just fine. The very poor have a safety net; they're taken care of. But the people in the middle, the hard-working Americans, are the people who need a break, and that's why I focus my tax cut right there. The generous reading of this is that it was an off-hand remark – that he doesn’t really believe the very poor are “taken care of.” I'd be inclined to believe that, if not for the fact that Romney embraces most Republican dogma these days -- and Republican dogma most definitely believes the poor are "taken care of." After all, Republicans keep saying the poor get off easy, because they don't pay income taxes. And Republicans keep proposing budgets that would result in massive cuts to safety net programs. Meanwhile, new government statistics suggest that poverty is at record levels – and would be even worse if not for government programs already stretched to the limit. Here's the irony: Of all the Republican contenders, Romeny is probably among the most sensitive to this issue. My guess (based on admittedly limited exposure to the man) is that he thinks of himself as somebody who really does care about society’s least fortunate members. He seems to take the idea of civic obligation seriously, much like his father did; it's among his best qualities. And when he was governor of Massachusetts, he was a driving force behind the universal health care law that unquestionably helped the state's poorest residents. But Romney has also said he'd balance the budget exclusively through spending cuts, which would decimate programs on which the poor rely. He's also pledged to repeal the Affordable Care Act, taking health insurance away from some 30 million people and, in the process, exposing them to much greater financial duress. Some of them would be middle class. Some of them would be poor. All of them would be worse off. And Romney is prepared to live with that. Cut Government Spending, Support Domestic Violence: That’s a harsh but fair reading of what’s been happening in Topeka, Kansas, where budget cuts have local authorities unable or unwilling to prosecute domestic violence cases because they lack the resources. The episode reached a new and distressing level of absurdity on Tuesday when Topeka's City Council voted to rescind the law making domestic violence a crime. The full story undoubtedly includes complications and spin -- you can read the New York Times account for yourself -- but the underlying reality is that severe austerity usually results in declining public services. The Wall Street Journal editorial page believes in free markets. And presumably its executives do too -- unless, of course, not enough people buy the paper. Then they will launder money to buy cheap copies of the paper to boost their circulation numbers. That's what the the Guardian is reporting Journal executives did in Europe. One of them, senior executive Andrew Langhoff, has now resigned. Undercovered Story of the Day: It's unlicensed and substandard day care, a topic about which you’ll be reading more here soon. Meantime, check out this alarming and distressing series from the St. Louis Post-Dispatch. Number of the Day: 64.7. That's the number of births per 1000 women between the ages of 15 and 44 in 2010. It's down from 69.6 in 2007. The likely explanation? In hard times, families have fewer children. The states with the steepest declines were also two of the hardest hit by the Great Recession: Arizona and Nevada. Via the Wall Street Journal. A Star Is Born? Former Michigan governor Jennifer Granholm is getting her own show on Current. It’s not her first try at television: As a young woman, she moved to Hollywood and even appeared on “The Dating Game.” But this show sounds like a better fit for Granholm. That's not a comment on her looks. It's a comment on her brains. She was Phi Beta Kappa at Berkeley before heading to Harvard Law School. And I Thought September Was Bad for the Red Sox: October is turning out even worse. The papers are running disparaging, thinly sourced assertions about departed manager Terry Francona. GM Theo Epstein is headed to the Cubs. To paraphrase Theo’s grandfather and great-uncle, at least we’ll always have 2004. Video Dedication of the Day: Bruce Springsteen updated this Great Depression song in 2006, after Hurricane Katrina, and dedicated it to former President Bush. I hope the Boss won't mind if I rededicate it, after last night, to wannabe president Romney.